Aaron Donald stands at an even 6 feet, undersized for an NFL defensive lineman. That hasn’t stopped him from becoming one of the most dominant and physically imposing interior lineman in the history of the NFL. Donald is coming off of a 20.5 sack regular season, and has made his home in opposing offenses’ backfields. All 6 feet 285 pounds of Donald looks like it was designed in the same laboratory that produced Julio Jones and Adrian Peterson. He’s an absolute monster and conceivably has a case for the MVP. The man tasked with stopping him? A 70 year old man from Los Angeles, who has resided in New England for the past 33. Dante Scarnecchia, New England’s offensive line coach, may not be a widely known name to NFL fans, but his lore is cemented in the NFL coaching community. That may or may not be true, but his success speaks for itself. The Patriots’ offensive lines have consistently been among the league’s best since Scarnecchia took over in 1999. 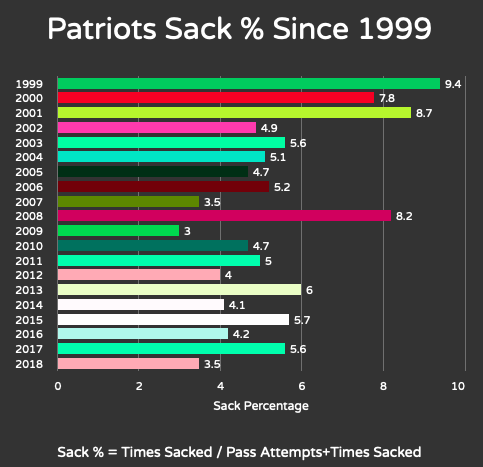 In 12 of the 17 seasons under Scarnecchia the Patriots’ offensive line has ranked in the top 10 in sack percentage. Two of the seasons outside of the top 10 were BB (Before Brady). One was with a rookie Brady stepping into the starting job. Another, in 2008, when Brady went down in the opener with a season-ending knee injury. Brady’s quick release and Scarnecchia’s lines are a match made in heaven (or maybe hell if you’re trying to defend it). Following the 2013 season, Scarnecchia decided to turn in his whistle and head for retirement. It wouldn’t last long. In the 2015 AFC Championship Game, Brady was sacked 4 times and hit a whopping 17 times. The Patriots finished that season ranked 15th in sack % and 30th in rush yards per attempt. 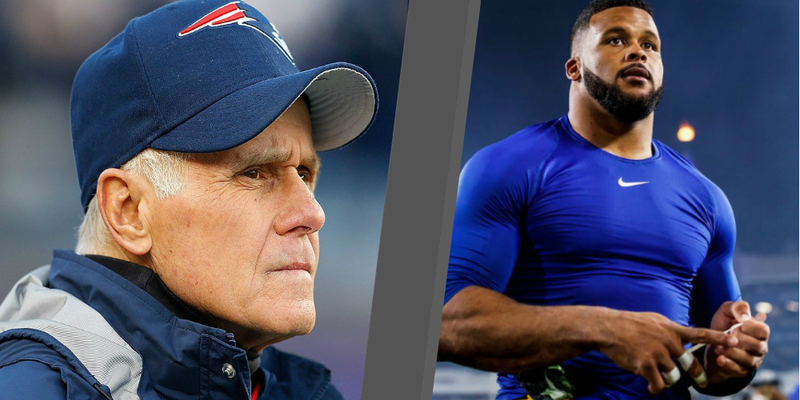 That offseason, Bill Belichick’s biggest recruiting job was convincing Scarnecchia to return. He did, and Falcons fans know how 2016 went. Fast forward to today. Scarnecchia is in the midst of his group’s best postseason performance of his tenure. Now, the final test for this group comes in the form of the aforementioned Aaron Donald and his fellow defensive linemen like Suh and Fowler Jr. The man in charger of directing that group? That’d be Mr. Wade Phillips. A name New England fans are very familiar with. Phillips has been one of the only coaches (outside of Tom Coughlin) who has been successful at getting pressure on Brady. The Patriots’ offensive success will hinge on the line’s ability to communicate and pick up blitzes. Again, they’ve been historically good at this, allowing ZERO sacks this postseason, but they haven’t faced a game-wrecker like Donald. Both of their previous playoff opponents, the Chargers & Chiefs, have elite edge-rushers, but were nowhere near as talented on the interior. Donald puts so much pressure on the line, even pre-snap. Think about what New England’s Center David Andrews will be facing every down. He’s responsible for communicating everyone’s responsibilities on the line, against a defense that sends pressure nearly every other down and constantly mixes looks. He must get everyone on the same page. Oh and that entire time, Aaron Donald is nose to nose with him across the line. If the Patriots win, Andrews and the rest of the line will have undoubtedly had a great performance. Offensive coordinator Josh McDaniels can do some things to help in that cause. Chip-blocks from backs and tight ends will be a must to allow Andrews and Shaq Mason or Joe Thuney to double Donald. Another thing to watch out for from the Patriots will be “max protection” plays. The Patriots are among the most successful teams in the league on 3-man route plays. Keeping a tight end and back in to block will allow Brady to take a few shots down field. It also helps that the Patriots are the best screen team in the league. Undoubtedly, New England will try to run against LA’s 23rd ranked rush defense, but this one will come down to Brady’s arm and Scarnecchia’s line’s ability to protect it. Brady and Belichick are shooting for their 6th ring. Scarnecchia, his 5th. To do it, they’ll have to stop the Goliath that wears 99 for Rams.